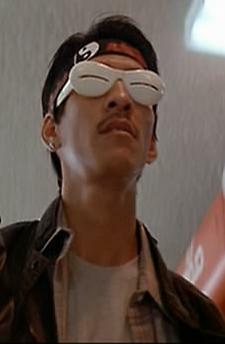 Years ago on mog.com, I wrote about Claus Cordes’ cover art for Klaus Schulz’s 1983 album Audentity, the new wave punk slit glasses shown in the film Big Trouble in Little China (1986), and the specialized glasses worn by Geordi La Forge, the blind engineer played by LeVar Burton in Star Trek: The Next Generation (1987-1994). Since then, I’ve been wondering about the art history that presaged Cordes’ design. 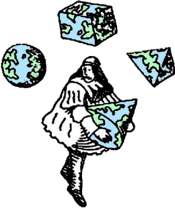 So this post is something of a meditation on the roots of this fashion, starting with the cyclopes of Greek cosmogony. Before they were made famous as one eyed monsters in Homer’s epic poem, The Odyssey, the cyclopes were known as primordial blacksmiths who could fashion the power of the universe into tridents and other weapons wielded by gods. 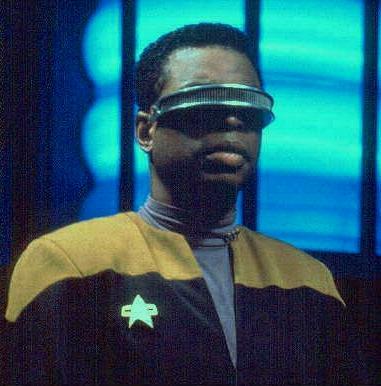 It’s not such a far leap to see La Forge (lit. the forge!) as a current incarnation of the cyclopaean archetype. According to a hymn of Callimachus, the Cyclopes were helpers at the forge of Hephaestus, the god of blacksmiths and craft. 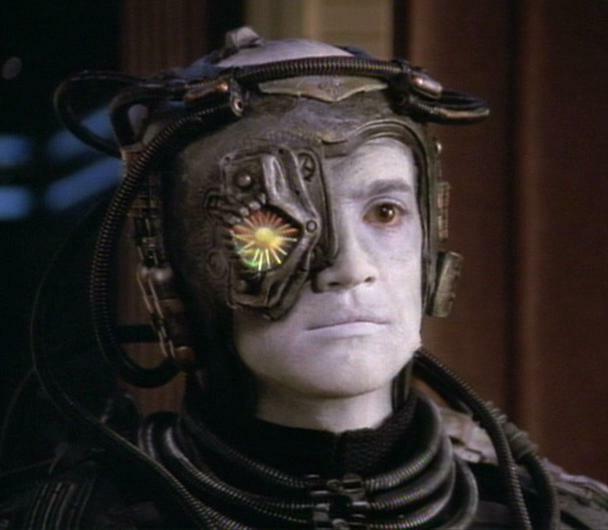 I can even see La Forge as a reconstituted Polyphemus, once blinded, but liberated from the darkest depths of Tartarus through the intervention of Technology. The depiction of a cyclops by Odilon Redon (see below, The Cyclops) follows less from Hesiod’s tale than from an antediluvian idyll. The cyclops in this garden to me appears to be modeling a primordial desire: a rather sheepish, male gaze. Is the cyclops of Redon a representation of the Edenic snake, the single eye symbolizing phallus and desire, staring at Eve? Or perhaps the cyclops is one of the mysterious נפילים (Nephilim), who in Genesis 6:1-4 desires of the daughters of Adam? The story is expanded on in aggadic literature both in Rabbinic midrash and in pseudepigrapha. There these Watchers and their progeny are giants that share some of the attributes of the Greek cyclops. In both myths, these divine figures possess useful technological knowledge. In the Book of Enoch it is the sharing of this knowledge with men that leads to the dissemination of evil on Earth. It should also be mentioned that Goliath, the foe of David singularly defeated by a single blow to the head from a slinged projectile, was characterized in midrash as the last of the race of Giants. 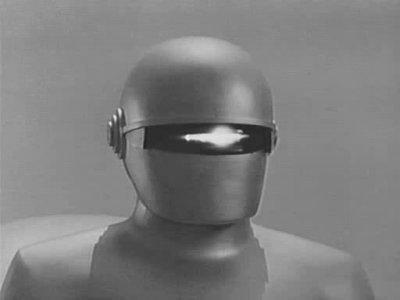 The first modern adaptation of the cyclops must be credited to the robot Gort from the 1951 sci-fi classic The Day the Earth Stood Still. Here too, there seems to be some syncretism between ancient Greek and Hebraic myth, except that the technology the heavenly beings wish to share with earthkind is wholly good, and it’s only our xenophobia and paranoid tendencies which cause mayhem. Fear of subjugation and the unknown replaces the earlier myth’s fear of sexual conquest of earth women (a common enough trope in other period sci-fi films). 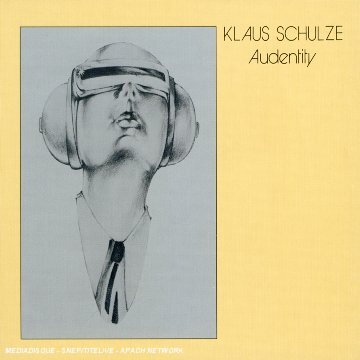 The slit eyed helmet of Gort seems the obvious root of the robotic fashion leading up to Claus Cordes’s cover art to Klaus Schulze’s Audentity (1983). A closer antecedent influencing Cordes may have been the design for the Cylon Centurions in the TV show Battlestar Galactica (the original series, 1978-1980). 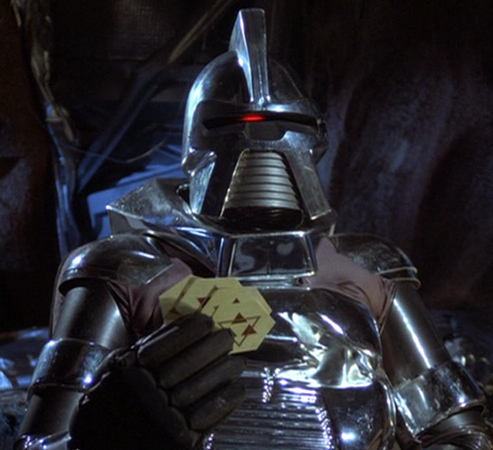 Pictured below, Cyrus, a Cylon from the episode “The Return of Starbuck” (aired May 5, 1980). Battlestar Gallactica was famously rife with biblical adaptations, from the wandering of the “twelve colonies” to the character of Adamah. It’s no surprise that the fecund imagination of the Mormon writer, Glen Larson, managed to stuff so much biblical myth into a show that aired at the peak of 70s fascination with UFOs and new age religion. Larson’s story of war between the civilizations of robotic Cyclons and space faring humans (developed to greater depth in Star Trek’s war withthe Borg) is another shade of the antediluvian battles described in the Book of Enoch and Jubilees. With these antecedents in mind, looking above back to Audentity, note Cordes’s translation of the cyclopean cliché from robot to human; Cordes is depicting some sort alienated audiophile listening to Schulze’s Kosmiche Musik. This is the cover Schulze should have had for his 1973 album Cyborg. Here is man like machine but not as automaton — rather, man as desocialized being, completely self-centered, and focused inwardly on processing piped in audio and perhaps also visual stimulus. 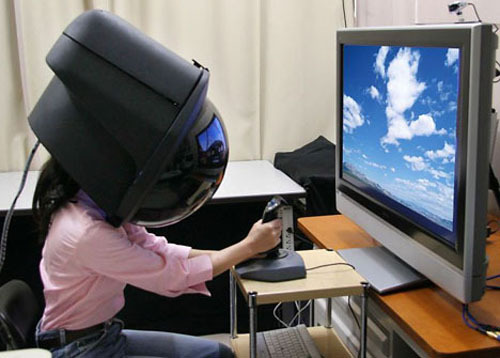 The commercial realization of this ideal has been evolving over the past 15 years with a profusion of (the not-yet-quite popular) head mounted displays (aka video goggles and video glasses). Even as the realization of this dream has (so far) failed consumers, the obverse of this ideal has been realized in the torture of prisoners of war by our horrible Bush administration. Insanity is the natural consequence of sensory deprivation inflicted on these prisoners. (See below Jose Padilla being led to a dentist, December 2006.) Others must endure the torture playlist. Where once the cyclopean eye represented the focal point of untold and mysterious power in the creature of Gort, in the characters of Maximillian and the Cylon Centurions the eye is demoted to the unblinking, unwavering madness of automatons that lack free-will and empathy. 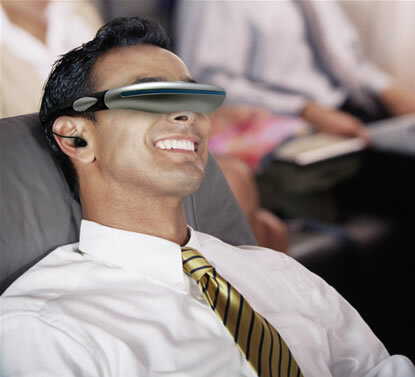 The bold vision of bringing sight to the blind depicted in Star Trek’s 25th century techno-utopia is perverted at the dawn of the 21st century. 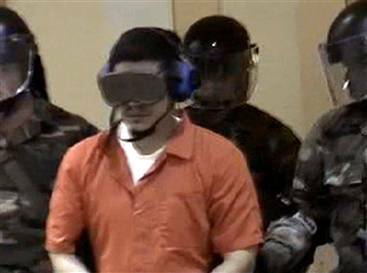 In Guantanamo (and presumably elsewhere) our society brings blindness and madness to the sighted and sane (imprisoned under suspicion of terrorism). Our blinding of presumed terrorists (officially, to prevent communication through blinking) recalls Odysseus’ blinding of the cyclops Polyphemus. But really, who now has become the myopic monster of yor, the blinder or the blind? I write with great hope that we will soon end this era of manufacturing suitable monsters, and suitable blindness. What do the single eyes of the cyclopes of Greek myth symbolize? The sacred inner eye turned outward? The realization and beneficence of inner knowledge expressed and realized in the outer world? How is the cyclops eye related to the single eyes (and the lost eyes) of Odin and Ra in Norse and Egyptian mythology? Does one eye represent empathy while the other a sort of panoptic embrace of all creation? If so, which eye is lost? Are the Cyclopes eyes related to the biblical character of Cain and the sign on his forehead? Are the extra-biblical myths of the Nephilim related to the Cyclopes who are renowned for their productive and creative capabilities? How might the eye of the cyclops be related to the shining light of the Tzohar or the brilliant eye of the Leviathan? Is this a kind of primordial eye that has not yet been divided into two (or more) eyes at a later stage of the cosmogony? Can the myth that masturbation leads to blindness be rooted in some sort of cyclopaean/phallic conflation? What then would the blinding of the cyclops represent for Odysseus? Strange questions to ponder in sleep with my inner eye open in dream. “The Eye that Blinds” is shared by Aharon N. Varady with a Creative Commons Attribution-ShareAlike 4.0 International copyleft license. Fixed! I should have thanked you eight years ago for your correction, Glawen. Is your blog reachable at a new address?